This past month, the world’s longest running carbon dioxide measurement site measured atmospheric carbon dioxide levels to be above 400 parts per million. While this has happened before, it has never happened in the height of the northern hemisphere summer, when carbon dioxide levels reach a yearly low due to growth of vegetation. This is a significant milestone, and it is almost certain that no one now living will see levels drop below 400 ppm during their lifetime. When observations at this site in Hawaii started in the 1950s, the average level of carbon dioxide was 315 ppm. This carbon dioxide is of course the most prevalent greenhouse gas, as well as the main cause of ocean acidification. There are some benefits to the current level of carbon dioxide (we likely have postponed the next ice age, for one). However, clearly continued increase in carbon dioxide levels will continue to change climate, raising sea level while also making it harder for many marine organisms to flourish (due to ocean acidification). We have reached a point where we need to stop increasing carbon in the atmosphere. For reference, carbon dioxide hasn't been this high in the atmosphere at any time during Homo sapiens tenure on this planet. 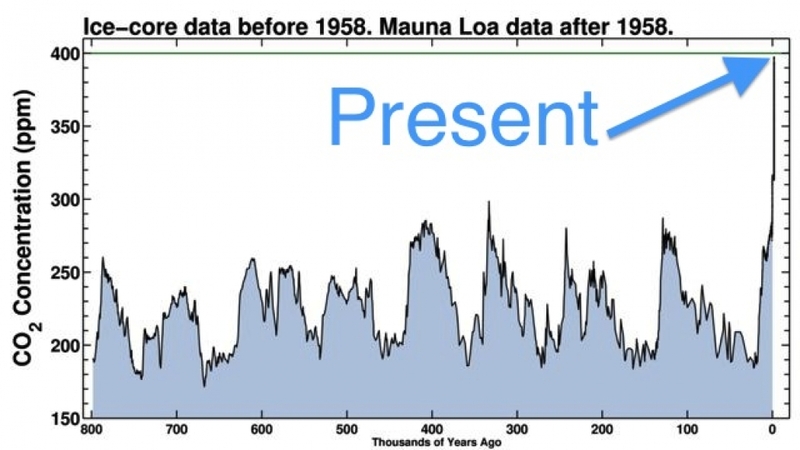 Carbon Dioxide levels are higher now than at any time in the last 800,000 years, at least. Credit: Scripps Institution of Oceanography. Almost all proposed "solutions" to this problem have really been efforts to just decrease how much carbon dioxide we are emitting, rather than removing any carbon dioxide. This is futile, as almost all human productive activity produces carbon dioxide (even making steel for wind turbines and mining lithium for batteries). Also, as more of the world electrifies, energy consumption and therefore carbon dioxide emissions will continue to increase from the developing world. You can hardly blame the people of India and Africa for wanting a standard of living we enjoyed 60 or 70 years ago in the U.S. This standard of living, currently, is only made possible by fossil fuels. So, what is to be done? We cannot stop using fossil fuels, so are we just stuck with the consequences of our emissions? The answer is a resounding no. Fossil fuels, specifically coal, are the compressed and aged products of ancient forests of massive trees, buried before organisms evolved that could readily dissolve lignin in wood. If we could replant reasonable numbers of massive trees, we could begin counteracting this emission of carbon dioxide. We have calculated that some single trees (for example, the General Grant Sequoia in California) have stored more than a lifetime's emissions of carbon dioxide. Even if we didn't plant massive trees, planting large numbers of smaller trees on currently dry, barren land would make the land productive and carbon sequestering. How is this to be done? 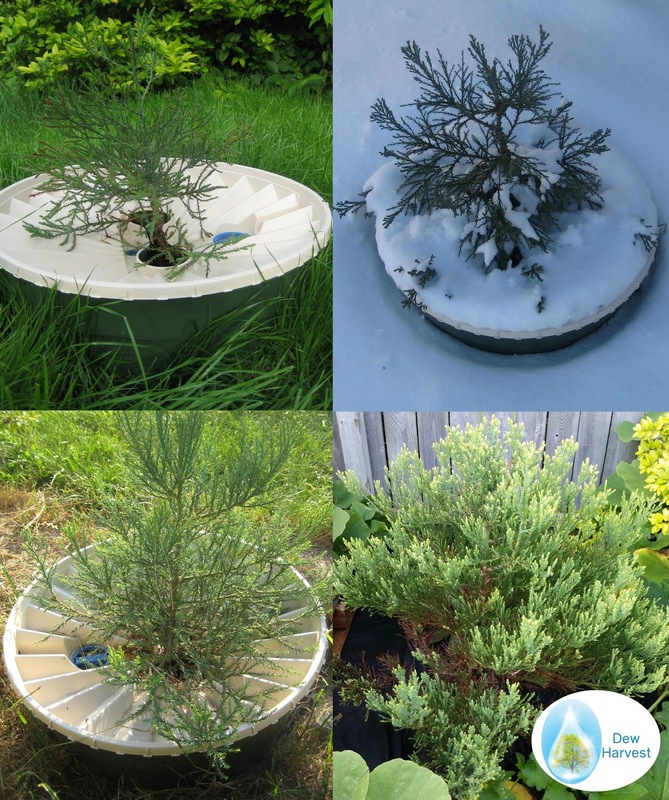 Planting sequoias outside their current range and planting trees in dry, barren areas has been made entirely possible by new technology, called the Groasis Waterboxx. A schematic cutaway view of the Groasis Waterboxx (from Groasis.com). Water is collected on the tan lid, funneled through the siphons shown in red to the green reservoir, and slowly released to the roots of the growing tree via the white wick. The Groasis Waterboxx acts as a self refilling water battery for trees. It collects condensation and rain water, stores it, and slowly releases it to the roots of a growing tree sapling. The method in which the water is released forms a water column beneath the Waterboxx, inducing the tree to grow deep roots that withstand future periods of drought. You can see Waterboxx results below. 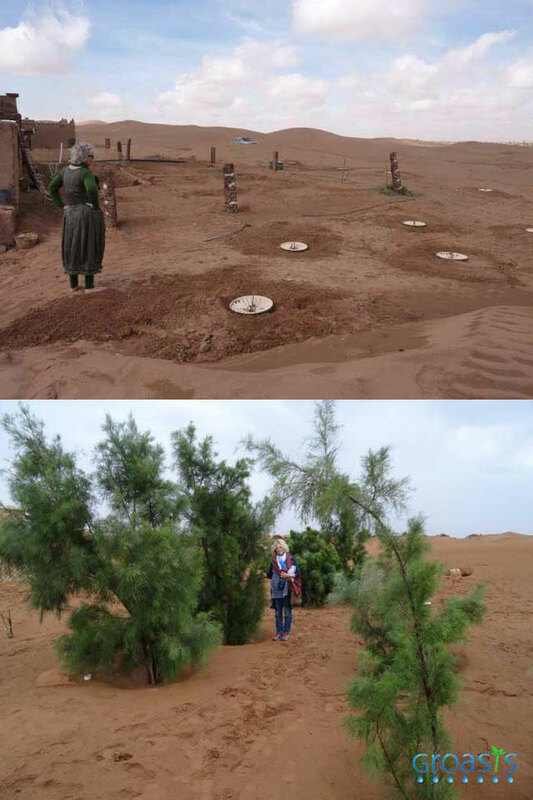 Three years' growth of a salt cedar (invasive in the U.S.) tree with the Groasis Waterboxx in the Sahara Desert! These trees had over 88% survival with no watering after planting when the Waterboxx was used. Two years' growth of a sequoia from planting with the Waterboxx in central Indiana. No water was given to this tree after planting with the Waterboxx, even after Waterboxx removal. The sequoia grew surprisingly well, and could easily be planted throughout the eastern U.S. with the Waterboxx. If you live in a part of the U.S. with near average or above average rain (25 or more inches), have you considered planting a sequoia or other large tree on your property? If you live in an arid part of the country, have you considered enriching your land, providing shade and sequestering carbon dioxide by planting desert-adapted trees. This is now possible with the Waterboxx. What is more, trees planted with the Waterboxx can be affordable, bare root trees, enabling large numbers to be planted. The Waterboxx itself is reusable for up to 10 years. Wouldn't it be rewarding to leave your land better than you found it, while taking action on the biggest environmental issue of human history?